This week, I had planned to write about the rise of Momentum and the predicament of Labour under Jeremy Corbyn ... but, I thought, do the readers of Conservative Home really want such a serious topic, on what is the last Bank Holiday before Christmas, when hopefully the sun is shining and you have better things to do? Instead I have chosen a lighter topic – a collection of “outtakes and bloomers” from my life as an Agent; the stories which normally come out after the second bottle of wine has been opened at dinner parties – and some only once the Port has been passed. Back in the early 1980s I was Chairman of Wallasey Young Conservatives. At the time the Association owned a grand building in its own grounds, in which we held the Annual Summer Garden Party. Discovering the first-floor kitchen knee-deep in soap-suds, after having put Fairy Liquid in the dishwasher, I found a tea-tray and started shovelling the suds out of the window as fast as I could ... not realising that our MP Lynda Chalker (Deputy Foreign Secretary) was standing beneath trying to draw the raffle. It took quite some time for her, and her security officers, to forgive me. My first Parliamentary campaign was 1987. In a letter sent to 800 Party members seeking help for the forthcoming election there were a number of tick-box options, including “... we will need help transporting Conservatives to the poll. Please bring a cat if you have one.” Spell-check (of course) didn’t pick up the error, but fortunately our sensible members brought their cars, not their cats! Taking Dennis Thatcher back to the railway station in my own car, after he had kindly addressed a fund-raising dinner. “What the &*%$ is that? !”, he asked animatedly. Following our unexpected victory in 1992 I thought it was an ideal time to contact lapsed members, encouraging them to rejoin. My somewhat over-triumphant letter opened with “1992 has been an outstanding year for us.” This seemed to go down well with the target audience, apart from our newly-former MP, one of the few to lose his seat! The letter clearly hurt, as he wrote about it many years later in a compendium of stories published by Iain Dale. At a West Kent fundraiser for 40:40 Target Seats. The Tunbridge Wells Annual Dinner is a major social and fundraising event in our local calendar. It is run with super efficiency by a team of volunteers who insist on having various sub-committees for each aspect of the event, and they kindly invite me to every meeting. Having sat through the “Menu Sub-committee”, the “Table Decoration Sub-committee”, and the “Auction Sub-committee”, I soon realised that they were more competent than me in making such arrangements, and that my presence was totally unnecessary. I therefore declined the offer to attend the “Raffle Sub-committee” as I didn’t think there was anything of value I could add. My only advice was to buy “five different books of tickets”, so that guests might buy a strip from each book. Come the night of the dinner, all seemed to be going well, when our Guest of Honour, Eric Pickles MP, was invited to draw the raffle. “56 Green”, he announced in his confident Yorkshire tone. “Over here!”, shouted a delighted lady. “I’ve got 56 Green too!”, said the man next to me. “So have I!”, piped up the President’s wife. “And me! !”, shrieked one of our councillors. “As have I”, bellowed a retired Colonel at the back. Suddenly, the horror of the situation dawned on me, the Raffle Sub-committee had taken my advice, and bought “five different books of tickets” – sadly, they were all green. This resulted in the winners being chosen by the serial number - not helped by the fact that half the guests couldn’t find their reading spectacles, and the other half had to turn up their hearing aids. After almost an hour, even the ebullient Mr Pickles was beginning to flag when, finally, someone claimed the traditional last prize .... the Lily of the Valley Talcum Powder. So there you have it! West Kent has its triumphs, and its disasters too. But, like most people, we are usually happier to talk about what’s going right rather than what is going wrong ... unless it’s a Bank Holiday Monday at the end of the “Silly Season”! 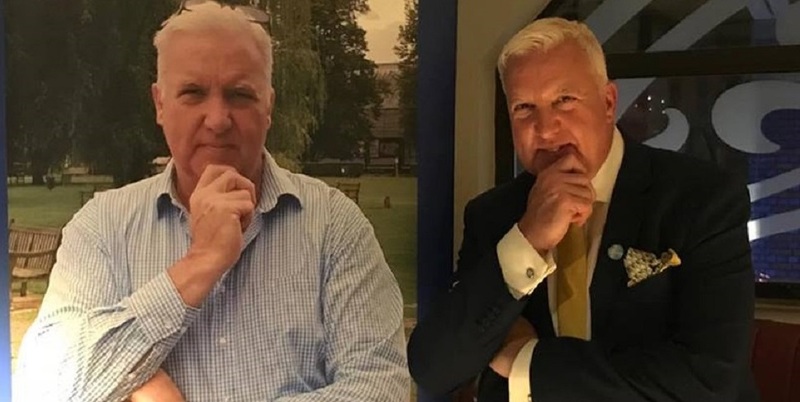 The planning behind "An Audience with..."
One of the reasons I write and maintain this blog is I know how useful it is to many activists and organisers working in constituencies without an agent or regular access to professional support. I probably receive 10-20 emails a week asking if a local Association can copy our ideas or thanking me for an idea which has been adapted for local use. I am always delighted to help and such positive feedback makes it worthwhile. One of the things I am asked most often is how we run our "An Audience with..." series of events, most recently this afternoon. I always reply fully - which can take some time. So to help others (and to help me in the future as rather than type out a reply each time someone emails I can simply direct them to this blog) here is my reply. Click HERE to read previous blog posts about our "An Audience With" events. "Thanks for your email and kind words about my blog. One of the reasons for keeping it going is I know many areas, particularly those without an agent, find it difficult to hear about new ideas and best practice. Our "Audience with..." events are super. They are simple to organise (no catering) cheap to sell (as apart from hall hire there is no cost) and the guests really like them as they don;'t have to sit through a two hour rubber chicken dinner then make a speech! Attendance varies depending on the guest, the venue and the time of year. So for Lord Trimble we had 130, Jacob Rees Mogg 180, Charles Moore 200, Sir Nicholas Soames 300, Baroness Trumpington 300 and for Boris Johnson almost 500. We aim to make £10 pp clear profit, so we charge usually charge £12 (£2 pp being the cost to hire the venue). We now advertise exclusively online and take electronic payments via PayPal, so there are no printing or postage costs. One of the guest coming next year is not a party member and has asked for a £500 contribution to his favourite charity. In this case I will add an additional £2 to the ticket price and inform members why. It is a very worthwhile charity and none will object. We also have a raffle (of course) which on average raises £3.80 pp. As well as inviting members, we also include registered supporters, donors and and any pledges we have an email address for within a 10 mile radius. If any of our local branches are delivering a newsletter, I try to include an advert and this can produce surprising results. About 20 tickets were sold for the Sir Nicholas Soames event to local residents via an ad in the branch In Touch! Normally around 25% of sales are to non members. I think these events are a great "entry point" for non members. Most are more than happy to pay £12 for an evening out but they wouldn't consider paying £40 for a dinner. Once they come and find out we are normal, pleasant and welcoming people, most come again. About 25% of attendees pay the additional £20 to attend the Champagne and Canape Reception. Some of our local members are uncomfortable with this as it can feel a bit exclusive, and I do appreciate their concerns. However, I would rather keep the basic ticket price low and allow people to "trade up" than have a higher entry price which would discourage attendance across the board. The reception is £20 extra for which guests receive two glasses of Champagne and canapes. I usually "sub contract" the reception to a local branch - the branch receives the full £20 pp and they buy the Champagne, make the canapes and serve / clear away. The branch also keeps the profit. If 50 attend the reception, this usually results in £500 profit for the branch, which is not a bad return given they are "piggy backing" on another event. 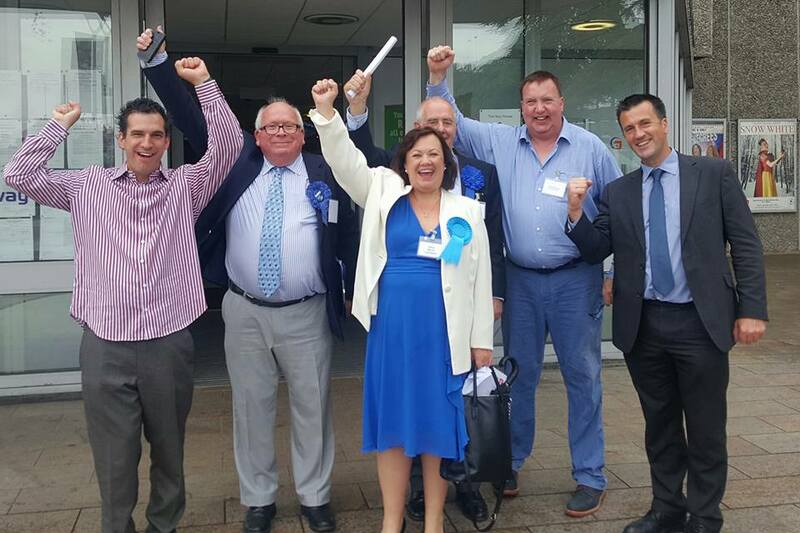 Earlier today I was delighted to be at Gravesham Borough Council to cheer the election of Diane Marsh as the new Conservative County Councillor for Gravesham East Division. Diane's victory was very significant indeed. Gravesham East is a bellwether seat - won by the Conservatives in 2009, gained by Labour in 2013 and now regained in 2016. The Division is large (25,000 voters) and contains a real cross-section of Gravesend's town centre community, including neighbourhoods with majority BME population, prosperous residential suburbs and several peripheral estates which have not elected a Conservative district councillor for many decades. Gravesham is not part of the West Kent Group and we only got involved at the invitation of the Gravesham Chairman. I advised on strategy in a low poll and assisted with targeted mail and GOTPV/GOTV messaging. Nothing new or groundbreaking - just the same stuff I have been talking about for decades. In the words of my good friend and fellow agent Louise Parry, "winning elections isn't difficult, it's just hard work." Yesterday (polling day) the West Kent Group provided over 20 volunteers and we ran GOTV in two of the seven wards which make-up the county seat. I was told by the Association President that we provided more Campaign Support than the rest of Kent combined. If so, the other areas of Kent (especially those with their own by-elections pending) should examine their consciences! I was also told that 7 of our 45 Conservative County Councillors turned out to assist, though I understand many traditionally take August off. Overall, the swing from Labour to Conservative in Gravesham East was 6.7%. Diane Marsh and her small team worked their socks off and deserved their win. I am pleased the West Kent team were able to help. Very recently an aggrieved candidate for Local Government Selection said to me “the trouble with you Andrew is that you always use the rules to achieve what you want.” To which I replied, “what you’re actually saying is that I won’t bend the rules so that you can achieve what you want”. He, at least, had the good grace to laugh. And I will give two examples. Four years ago an incumbent County Councillor was challenged by a District Councillor. As always in such circumstances the Selection Meeting is held on neutral territory to avoid showing favouritism to either candidate. At the time the challenger emailed to thank me for my impartiality. This year the challenger (who is now the incumbent) is himself being challenged, and again the contest is on neutral ground. This time, however, the incumbent has complained that the contest isn’t in his home village as “this is where most of the members live”. And elsewhere ... four years ago a potential challenger was excluded as he forgot to submit his application by the deadline. At the time the incumbent thanked me for “vigourously upholding the rules.” This time the incumbent is not so lucky, and the contest is going ahead. Respect for the rules however, didn’t stop the incumbent phoning to ask if there was any “procedural mechanism” I could use to stop the challenge taking place! He laughed, and pretended it was a joke. I laughed too. I was, of course, referring to the rules that were introduced over 6 years ago. I suspect many Associations will see the National Rules as “another bloody attempt by CCHQ to take over our independence”, but personally I see little wrong with a national organisation trying to ensure a similar standard and process is followed throughout the country. The Mandatory Selection Rules do not instruct Associations as to who they should select, and they even allow local autonomy as to the composition of the Selection Committees and the process used. They simply try to ensure that a similar standard is set nationwide, that incumbent and new applicants are treated fairly, and that there is a clear appeal process when needed. The process we use in West Kent has not only been recognised as “Good Practice” by the Conservative Councillors Association (CCA) but has also been adopted by many of our neighbouring Associations for its fairness and simplicity. I will describe the process below. Each Association Executive elects a Local Government Committee at the first meeting following the Association AGM. In addition to those who serve on the LGC by right (Chairman, DC Political, and the Leaders of the Local Council Conservative Groups) we also utilise the “additional members which the Executive Council deem suitable” clause to ensure the LGC is representative and not simply a committee of the “great and good” seeking to maintain the status quo. The LGC meets expediently to set out the selection timetable which is circulated widely to all interested parties. This will normally produce a flurry of interested people, some of whom are members, many more who are not. These are then invited to an information evening where they hear from a sitting councillor about the work they do on behalf of the community. I also speak, as Agent, about the campaigning obligations they will expected to undertake during an election. This ensures that all applicants have a clear understanding of what will be expected of them if they pursue their application and are ultimately selected. Following the information session, applicants complete an application form (there are two standard versions, one for incumbent councillors seeking re-election, and another for new applicants). At this stage around 50% drop out, having realised the time commitment, or the work of a local councillor is not something they wish to commit to. The LGC then arranges a number of evenings to interview applicants (incumbents and new). These interviews are thorough, and can at times be bruising. References provided on application forms are always followed up, applicants are examined for evidence of community commitment and incumbent councillors are questioned about their performance within their community, the Council Group and their efforts towards the Association’s wider campaigning goals. We also undertake a review of the applicant’s social media “footprint” to ensure there are no nasty surprises lurking on the internet! It is far from unusual for our LGCs to decline an application, nor are they afraid to refuse to put an incumbent back on the “Approved List” if there is strong evidence of poor performance. Once the interviews have been completed, the Association will have created an “Approved List”, members of which are invited to put their names forward for individual seat selection. Every seat is considered “equal”, and approved candidates may apply for as few or as many as they wish. The Rules now get complicated! If there are more applicants than vacancies, the Branch (or joint branches if there are more than one) decide who goes forward to the final contest. The incumbent always has a right to be in the final. Unfortunately, even in West Kent, where our organisation is strong, there are very few County Council Divisions which have active branches covering every area of the Division. This could lead to only four or five members of one Branch Committee imposing a candidate on the whole Division and disenfranchising the members living elsewhere. Locally our Executive Councils have taken the decision that unless there are active Branches covering the entire County Division then all applicants will go forward to a Special General Meeting of the all the members living in that Division. The view we take in West Kent is that allowing our members the right to choose their candidate is not only the right thing to do, but also a valuable and rewarding aspect of membership. The above rule however, does not apply if membership of the Division (or ward) is below 2% of the previous Conservative vote at the last election. For example, if we are selecting a candidate for Barchester and the previous Conservative vote for Barchester was 2000, there would need to be a minimum of 40 members to qualify for self-selection. This requirement is set by CCHQ to ensure that there is not a branch of 5 members selecting their best friends. If the membership is below this threshold then the LGC selects the candidate instead. In making this decision the LGC can use various legitimate means to inform its decision-making. Members may be invited to attend the LGC meeting, and participate in the questioning of the candidates. And (a recent change introduced to the rules by Rob Semple, following testing in West Kent) is the right of Associations to hold a “Local Primary”. Ultimately all decisions must be ratified by the Executive Council of the Association. This process is open, transparent and fair. It balances the rights of incumbent councillors with the aspirations of new applicants and it ultimately allows the members to choose who represents them at election time. And, just as Association and Branch Officers must account for their performance before they are re-elected at the AGM, as indeed the Association staff have to account for our performance at our Annual Appraisals, so incumbent councillors must account for their own records. This whole process can, at various moments, cause ill-feeling – particularly from sitting councillors who are often genuinely shocked at being challenged for “their” seat, and who can even question the right of members to do so. There is also a temptation to “shoot the messenger” which is understandable, but not fair. As Agent, my job is to facilitate an open and fair contest. It matters little to me who, from the Approved List, is selected for each seat, as my duty is to get them elected regardless. I take a degree of satisfaction that in helping to manage over 500 local government selections in my patch (over 7 years) , there has only been one successful appeal, and that was when an out-going Chairman thought the rules were “tedious” and refused to follow them! News has reached me from north of Oxford (and that's all I will say) that a member responded to an urgent appeal for assistance from a neighbouring Association. Apparently there was a "tedious clerical job" which needed doing, which would save the Association funds. It transpires that "tedious clerical job" was opening thousands of undelivered Voter ID surveys left over from last May's elections: surveys which the candidates had not bothered to collect from the Association office. They were removing the Business Reply Envelope for future use. Happily our volunteer got to work, joining in the general anger about "lazy candidates who don't pull their weight" only to find when she opened her first envelope it was a Voter ID Survey with her name and face on it. An awkward silence filled the room as people pretended not to notice, until an angry councillor who had worked himself to a point of exhaustion trying to retain his ward and supporting vulnerable colleagues, piped-up "what a shame that you didn't spend three hours delivering these instead of three hours unpacking them, as if you had you may have won your seat." The team are wondering if she will show up next week! In September the five West Kent Associations will be moving to the third and final stage of our selection process for next year's County Council elections. West Kent elects a third of Kent's County Members and almost 50% of the Conservative Group; so we have a massive responsibility to ensure the best people are selected and elected. I have today circulated the booklet (below) to all incumbent County Members, new applicants, Association Officers, Branch Chairmen and members of the various Executive Councils. The booklet sets-out the process, how we have reached this point, the work done by our five Local Government Committee's, the selection grid and timetable (including applicants, venues, dates and times of selection meetings), how each meeting will be organised and conducted and FAQs. NB I have redacted the selection grid and timetable from this version as I don't think the names of applicants and which Divisions are being contested is a matter for publication. I hope others may find this document of interest. The CCHQ Mandatory Selection Rules are cumbersome and could no doubt be improved, but generally speaking they ensure that a committee appointed by the Executive Council maintains a list of suitable candidates and ultimately allows our members the final decision on who represents the Party at election time. I hope the demands for reform by those with a vested interest does not result in the baby being thrown out with the bathwater. I am pleased that our local West Kent Associations, with full support and encouragement from our Members of Parliament, have now finalised plans to formally welcome and meet our 500+ new members. Each Association will be hosting a reception with the local Member of Parliament present and speaking. The receptions vary from Pimms in the gardens of the local Conservative Club, to a glass of local Chapel Down wine in a trendy "pop-up" restaurant venue, to a complimentary ticket to the Association's Annual Barbecue. It's fantastic that our local Associations have put so much thought into such a variety of events, but the main thing is they are all making the effort. So far our new members have received a welcome letter, an invitation to participate in a survey to ascertain how they would like to engage and what they hope to achieve, and now an invitation to meet the local Officers and MP over an informal drink. It's certainly a lot more than I got when I joined (from memory I got a begrudging thank you from a crusty Branch Chairman and a pile of leaflets to deliver). Here are samples of the Chatham & Aylesford and Tonbridge & Malling invitations.